Faculty of Pharmacy, University of Indonesia, 16424, Depok, INDONESIA. Background: Treatment for type-2 diabetes mellitus focuses on the incretin hormone, Glucagon-Like Peptide-1 (GLP-1). However, it has a short half-life. Inhibition of the enzyme Dipeptidyl peptidase IV (DPP IV) required maintaining the active form of GLP-1. Based on the previous studies on the highest activity of DPP IV enzyme inhibition of white tea extract, this study conducted on the fraction of white tea extract using rat blood serum (ex vivo). Objectives: This study aims to evaluate the inhibitory activity of fraction from white tea extract. Methods: White tea leaves extracted with ethanol. The inhibitory activity determined by using rat blood serum as DPP IV enzyme source (ex vivo), AMC (7-amino 4-methyl coumarin) as fluorescence substrate of DPP IV and sitagliptin as the standard reference. The the cleavage of fluorescence reaction product observed by a microplate reader with λex = 360 nm and λem = 460 nm at 37oC. Data expressed as mean ± SD and the IC50 value determined by nonlinear regression curve and fit using Prism Graph 7. 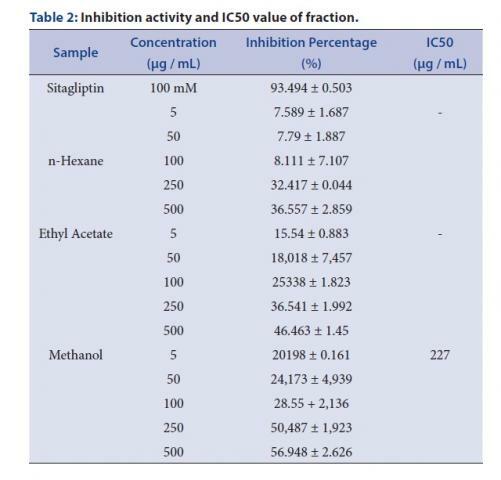 Result: Methanol fraction (250 μg/mL) has the greater inhibition percentage (50.487%), and the fraction of n-hexane and ethyl acetate are 32.417% and 36.541%. The methanol fraction IC50 value is 227 μg /mL. Conclusion: The methanol fraction is the most active to inhibit DPP IV enzyme. Keywords:Antidiabetic, Camellia sinensis, Dipeptidyl peptidase IV, DPP IV, Fraction, White tea. Ekayanti M, Sauriasari R, Elya B. Dipeptidyl peptidase IV Inhibitory Activity of Fraction from White Tea Ethanolic Extract (Camellia sinensis (L.) Kuntze) ex vivo. Pharmacognosy Journal. 2018;10(1):190-193.